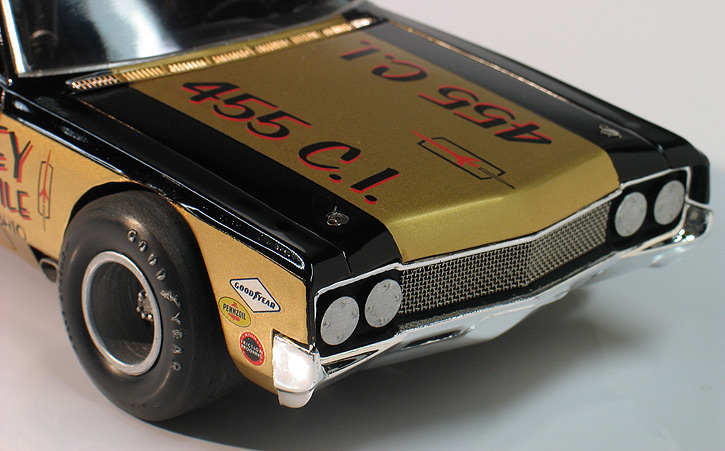 I recently built a fictional '64 Olds F-85 drag car sponsored by Hurst Shifters. While I was working on that model I thought it might be interesting to build a another car using a similar paint scheme. Since AMT recently re-issued it's ancient '65 Oldsmobile Delta 88 modified stock car kit I thought the two Oldsmobiles would make interesting teammates. For my concept I imagined that in the '60's, Hurst Corporation was looking to expand their sponsorships outside of the drag racing world. 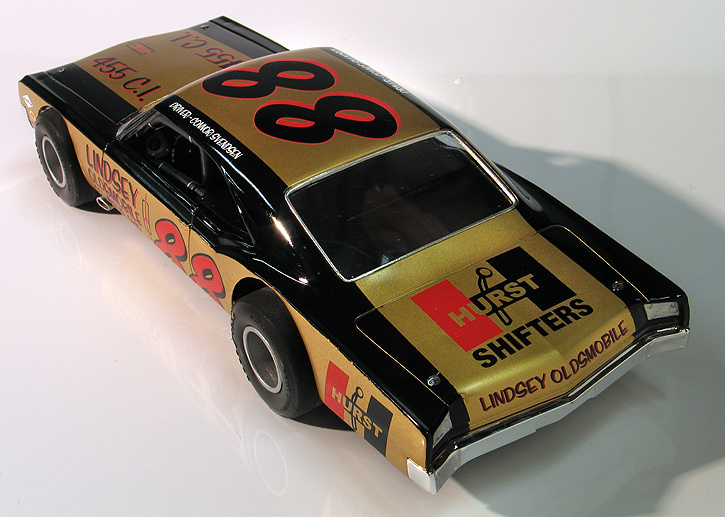 They teamed up with the fictional car dealer Lindsey Oldsmobile to build a circle track car to race the local short tracks of the midwest. I wanted my Olds Delta to have a convincing '60's era low buck paint scheme, so I designed my own custom graphics for the model and had custom dry transfers made of my artwork. 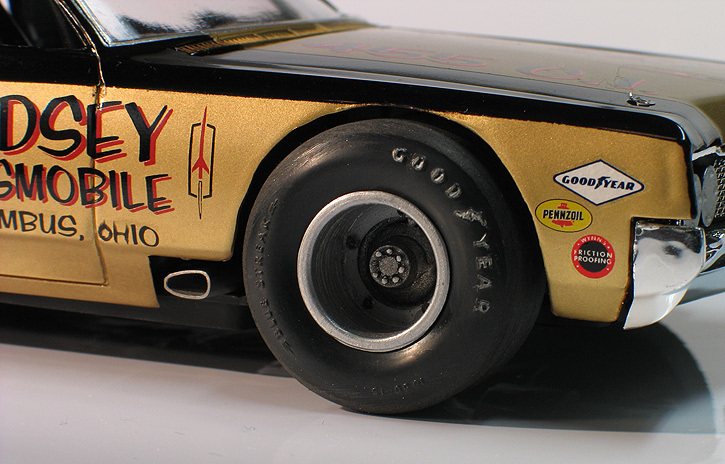 The design features a lot of sign painter style hand lettering typical for these types of racing cars. For the paint, I used Tamiya black and gold shot from the can. After applying the dry transfers and a few additional sponsor decals from my parts box, I gave the whole thing one light coat of Tamiya gloss clear to seal the dry transfers. Unlike many of the drag cars I've built, I didn't want this paint job to be overly glossy. In real life most low budget race cars usually got quick and dirty paint jobs that were less than show quality, so I tried to make mine have an authentic look. This AMT kit is rather simplistic but I added a few details to try and make it look a little more realistic. First, the body of the kit was incredibly thick, so I used a Dremel to grind down the back sides of the wheel openings. I do this to most of the models I build because it helps the wheel openings have a more realistic scale appearance when viewed from a 3/4 angle. Since most of these types of race cars have a raw metal edge in the opening I didn't have to be too concerned about how smooth the opening looked. Second, I replaced the kit's toy-ish oversized tires and wheels. The short track style race wheels are resin pieces that I bought from a vendor on ebay. They were painted with varying shades of Testors' Metalizers. Better sized tires were sourced from my spare parts box. The tires were roughed up with course sand paper and then weathered with pastels to make them look well used. I'm not sure what kit the tires came in originally. My spare parts box has stuff in it going back 40 years, so I can't always remember what came from where. Additionally, I modified the suspension points so the car would sit lower. I also added side exhaust dumps made from aluminum tubing. The kit also does not come with a rear window, so I made a new one from clear sheet acetate. The grill was made from real small scale metal mesh. Lastly, I added photo-etched hood pins to the hood and trunk. While these old modified stock car kits are somewhat crude by today's standards, I think they are fun to build and really come to life with just a few small additions. I've already built the '66 Impala kit from this series and plan to build the '64 Galaxie, '65 GTO, '65 Fairlane, '65 Chevelle, '66 Skylark, '69 Falcon and '69 Torino soon.